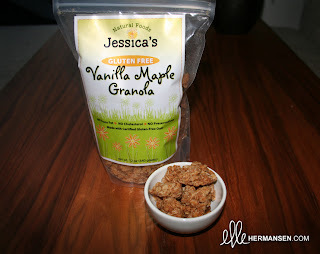 ellehermansen: Jessica's Natural Foods: All Natural Gluten-Free Granola! Happy New Year! God Nytt År! First blog video with Canon FS200! Olympic 2010 Torch Goes Through Strathroy! Tassimo by Bosch: The Art of a Perfect Cup! The Grinch Who Stole My Heart! World's Largest Mistletoe at Heathrow! Orrefors: Swedish Crystal Happy Santas! The Year 2009 in Auto Tune! Renaa Restaurant Goes Gluten-Free for Me! Naked Ingredients: 69 Sensual Recipes. Marina and the Diamonds: Hollywood! 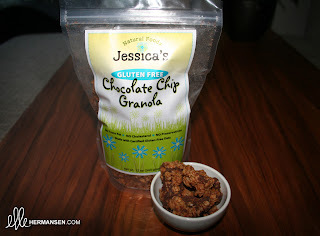 Jessica's Natural Foods: All Natural Gluten-Free Granola! Holy Granola! I ate almost all three bags of this uber delishous treat in one go, without feeling any measure of guilt - for filling my body full of bad preservatives as this great snack contains absolutely NO artificial flavours, colours, preservatives, trans fat, or cholestrol. I usually get insane headaches after eating candy and refined sugars but of course this didn't cause me any pain - as it also contains no highly refined sweeteners. Jessica's Natural Foods have done their research and found gluten-free oats (as they usually contain wheat, being milled in the same facility) and mixed them with magical ingredients, depending on the flavour. There are three choices; "Almond Cherry", "Chocolate Chip" and "Vanilla Maple" - and they all taste equally divine! I thought I would break down each of the flavours to help you decide. But, it would be in your favour to be indecisive and try all three. They are just that good! Chocolate Chip Granola: I really liked the chocolate in this one, because it was very tasteful and not overpowering at all. They seem to be semi-sweet, which is complimentary to this mix, while rocking a sweet taste of honey, brown sugar and maple syrup, to keep the pieces together - with a nice hit of vanilla and cinnamon right at the end. 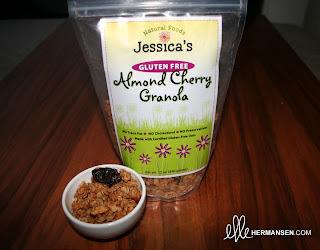 Almond Cherry Granola: These dried Michigan cherries make this granola mix. Seriously. Like all of the flavours, they contain flax seed which is so good for your digestive system, making it quite easy to digest. The almonds remind me of Christmas when mixed with the cinnamon. This also tastes amazing with milk - eating it as a cereal. Hense eating the whole bag (all three over a weekend span) without feeling sick nor sluggish, like after most snacks I try (other treats have loads of refined sugar which can really exhaust you). Almond Cherry Granola = Extremely good. Pure vanilla extracts taste like quality throughout this flavour. I think it would be wonderful to sprinkle this over vanilla ice cream as a super easy treat for guests (and your tummy of course). I'm truly loving this one as well. You can order all three of these, or whatever flavour strikes your fancy, from Jessica's Natural Foods here. Do you see how I've lingered here reading your posts as if I were a crazy fan but I can't help it your blog is most interesting. You are the sweetest, Simone! Arent these awesome! I loved them! I got really posessive when my family wanted some though. Screw 'em...these are mine! I know!!! They are so amazing! :D Mmmm!! !